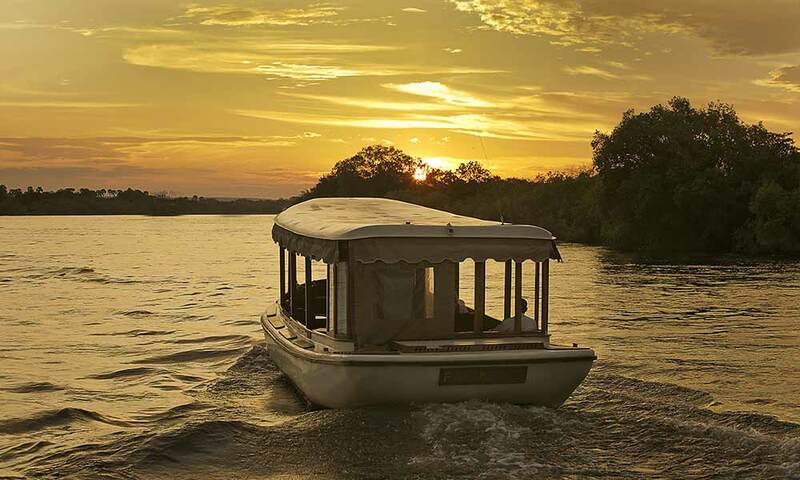 The Ra-Ikane River boats – owned by Ilala Lodge Hotel – are a fleet of monohulled boats that originate from a rich history of David Livingstone’s extraordinary expeditions along the Zambezi River. Comprising of three luxury river cruise boats, the Ra-Ikane exudes a grace of a bygone era. If you are wondering where the name came from for the Ra-Ikane I, II and III, it was in honour of the instrumental guide, Lazarus Ra-Ikane, who accompanied Livingstone in his monumental discovery of the majestic Victoria Falls. A voyage onboard Ra-Ikane consists of a selection of luxurious cruises. These include a breakfast, lunch, birdwatching and sunset cruise. 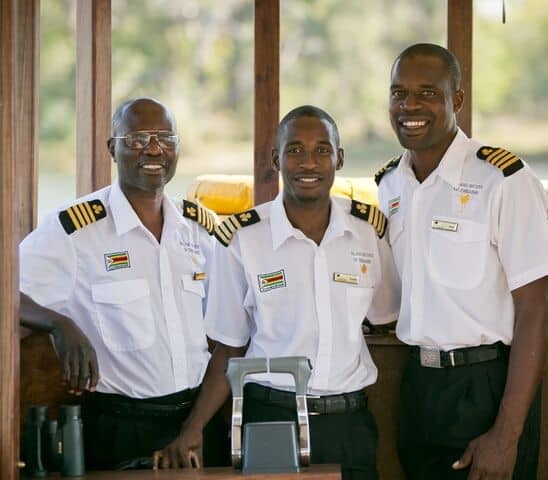 The boats can also be hired for private charter, should you desire a more personal cruise or would like to celebrate a special and memorable occasion along the Zambezi River. Each vessel is 10.4 metres long, 3.5 metres wide and comfortably holds up to 16 guests and a welcoming crew. Furnished with the finest quality teak chairs and tables, the boat exudes a sense of old-world charm. Seats can be arranged to suit your party size, while collapsible tables ensure you are poised for the best viewing spot – so you won’t miss out on the exceptional wildlife that can be viewed along the way. The low profile and slim structure of the boats allow effortless gliding through the water. Drifting gently in and out of narrow channels on the river – bringing you closer to the flora and fauna scattered along its banks. 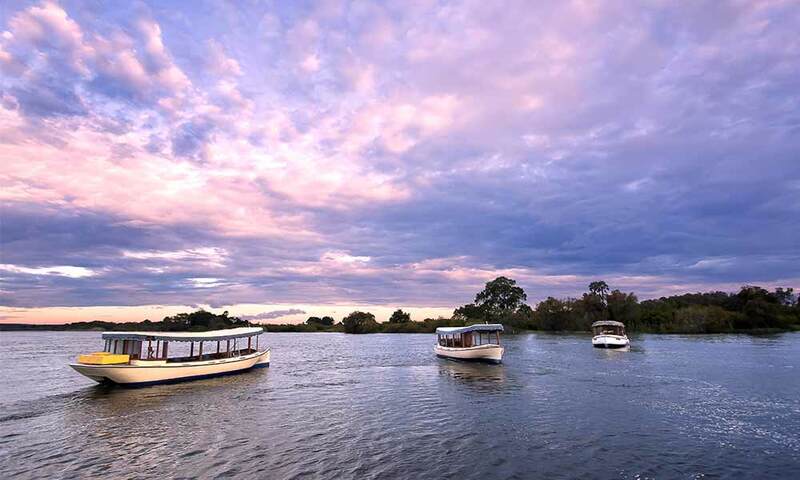 Two outboard motors supply ample power for the boats to cruise against the current of the Zambezi River. The small motors are quiet enough to soundlessly approach both wildlife and birdlife, bringing you closer to the action, without ever disturbing the animals in their natural habitat. 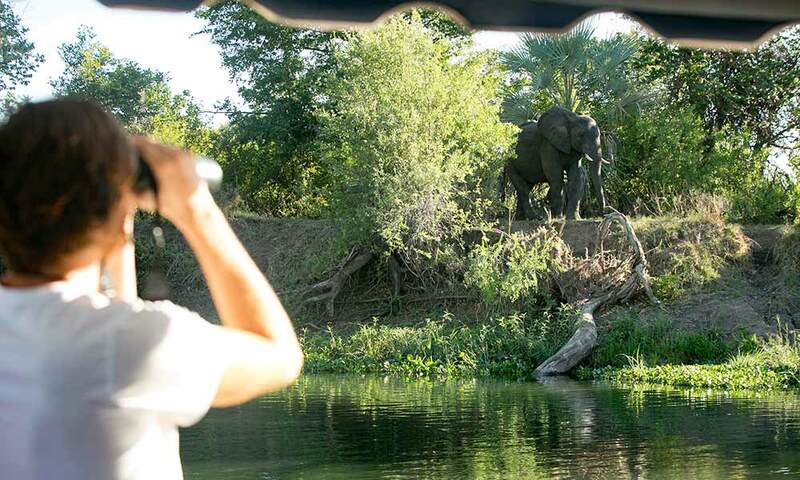 Each Ra-Ikane River Cruise boat is staffed with a professional and knowledgeable Boat Captain, equipped with vast experience of the area as well as the animals that inhabit it. Accompanying him, is a helpful and welcoming waiter who delivers exceptional service to ensure you experience utmost indulgence as you sit back, relax and soak in the wild surroundings. A selection of delicious food and beverages can be enjoyed on all of our cruises, no matter the time or day! For early-risers and keen bird lovers, the Birdwatching Cruise promises exceptional sightings of feathered-wildlife as you cruise along the river. It can also be combined with our Breakfast Cruise, which offers a full continental breakfast and a variety of freshly brewed teas, coffees and juices. 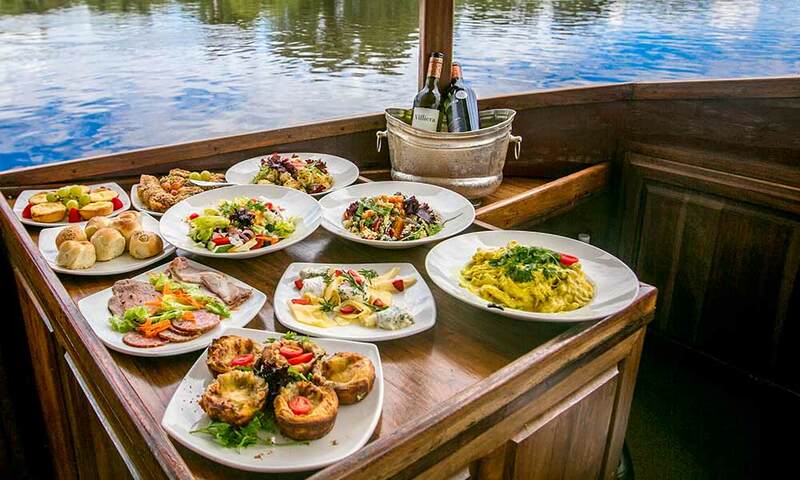 A feast awaits you onboard the Lunch Cruise with an abundant buffet of cold meats, fresh salads and other delicacies prepared by The Palm Restaurant which was recently awarded a TripAdvisor 2018 – Certificate of Excellence. A bottomless-selection of ice-cold beverages will keep you feeling refreshed and hydrated while out in the midday sun. Take some time out from your busy safari itinerary to join our Sunset Cruise, where a wide array of gourmet snacks accompanied by a selection of premium drinks will be served, as you soak up the last rays of sunshine for the day. Whichever cruise you choose, remember to wear comfortable shoes, bring along a light jacket and of course your camera or binoculars, a hat and sunglasses, and remember to be on the lookout during your two-hour journey exploring the river for the amazing birdlife and wildlife dispersed along the banks. 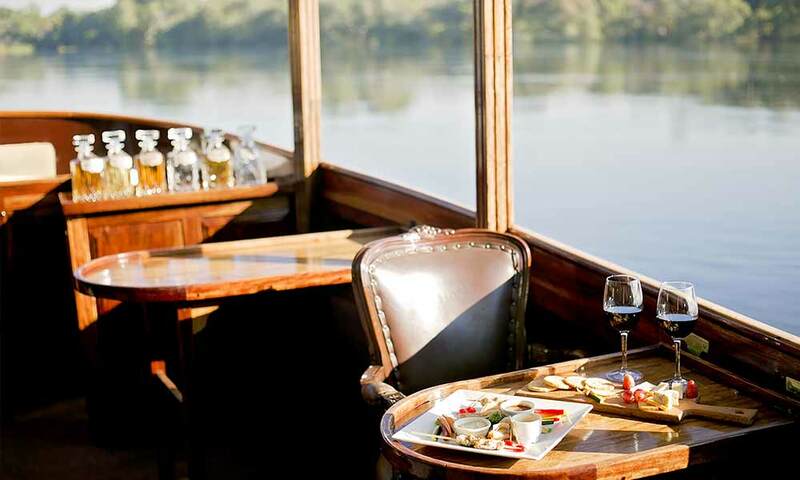 For further information on how to book your Ra-Ikane River Cruise today, stop by the Guest Activities Desk at Ilala Lodge Hotel, send us an email at raikane@ilalalodge.co.zw. We look forward to hearing from you! The Ra-Ikane offers a unique vantage point for viewing birdlife and wildlife up-close on the islands along the river. This is unquestionably an activity to add to your bucket list when in Victoria Falls. © Ra-Ikane - 2019. All rights reserved.